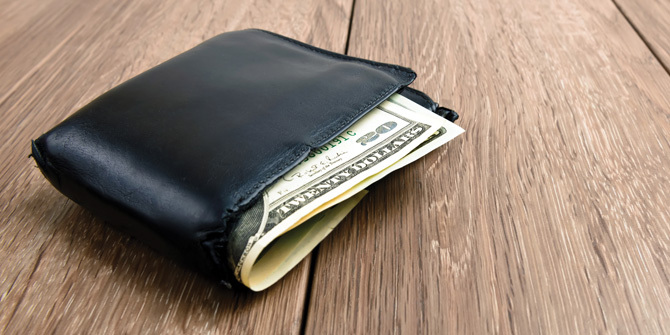 Many of us have thin wallets because we simply spend too much. A job loss or a leaky roof can suddenly empty a wallet, too, but for most, overspending is the real problem. To add more weight to your wallet, you may just need some organization and discipline to reduce spending. Getting organized is half the battle to improving your financial well-being. First, you need to nail down where your money goes. So write down every penny you spend for a month to see exactly where your paycheck is going. Then, subtract your monthly spending from your monthly income to see where you stand. Next, add a little digital organization in the mix. Mark your calendar for when bills are due. Then use BillPay to set up automatic payments well ahead of their due dates to avoid draining your wallet on late fees or penalties. Schedule an automatic transfer from your LGFCU Checking Account into your share savings account to put a little money away each week as a buffer for emergencies, job loss or an unexpected home repair. And your last step to being organized is to get a copy of your credit report at annualcreditreport.com. You’ll want to verify the accuracy of your report and see if there are areas you may need to fix. Now you’re ready to make a plan for your extra cash you can stick to. Set specific and measureable goals so you know where you’re going. Commit to living within boundaries you can stick to. Make a few sacrifices and accept that you can live without some luxuries. Check progress toward your goals each week or month and make adjustments to spending as needed. Get support from family and friends. Share your plans and give them permission to remind you of your purpose if you go off track. To simplify and help you keep track of your money, sign up for Compass, LGFCU’s money management tool. With Compass, you can easily see where all of your money is going and where you’re spending the most. You can also set up budgets and establish alerts to notify you when a bill is due or you’re spending too much. With organization, commitment, discipline and a solid plan, you’re on your way to stretching your paycheck and fattening your wallet.